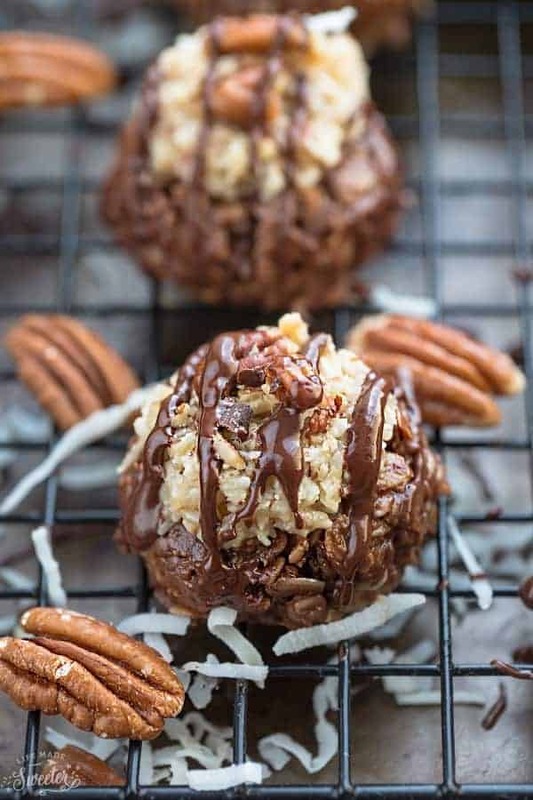 Soft and perfectly chewy No Bake German Chocolate Cake Cookies made with a rich chocolatey oven free oatmeal base topped with a gooey coconut pecan frosting and a drizzle of chocolate! They’re gluten free, egg free, dairy free and paleo friendly. Pin for later AND follow my Recipes Board for more NO BAKE treats! Cookies are one of my kiddos favorite bite-sized treats to make with me in the kitchen. No matter what they’re doing, they’ll always rush over to try and “help” when they know that cookies are on the agenda. Sure it takes about triple the amount of time to make and clean up than if I were to bake alone, but I seriously do cherish these special moments I have with them. Their favorite part is when they get to stir all the ingredients together and it’s pretty much guaranteed they’ll fight over who gets to lick the spoon clean. Speaking of licking the spoon clean, they totally did that with these No Bake German Chocolate Cake Cookies we made last month. 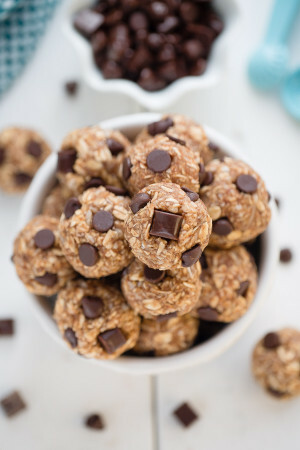 And although I’ve seen a few versions of German Chocolate Cake Cookies, none of them were NO bake which is totally necessary for those hot days you don’t feel like turning on your oven. These have all the classic flavors of the popular dessert, in a soft and chewy cookie form and taste seriously amazing. You want to know the best part? They’re completely paleo friendly but they taste so rich and decadent that you wouldn’t guess that they’re made with healthier ingredients! I’ve made this multiple times and if a paleo-friendly version doesn’t tickle your fancy, I’ve also included options for a regular version in the recipe as well. 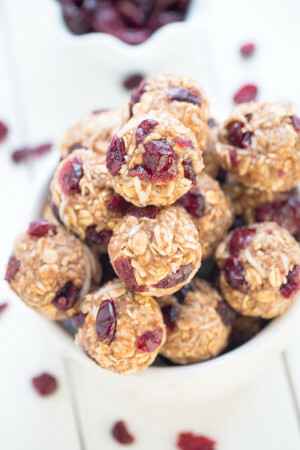 The cookies are packed with coconut oil, maple syrup, almond butter, shredded coconut, vanilla and rolled oats, which are wholesome, hearty and completely gluten free. The rich and chocolatey oatmeal base gets topped off with a gooey dairy and egg free coconut pecan frosting along with a drizzle of chocolate that ties the whole thing together. 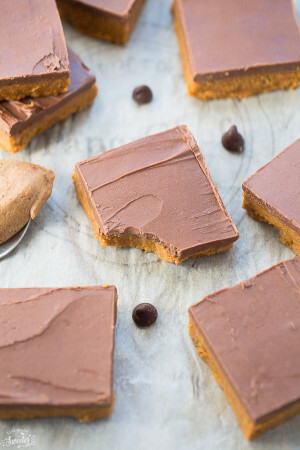 These paleo-friendly bite-sized treats are perfect for curbing any major sweet tooth craving and make a fun addition to any cookie platter. Rich, decadent and totally addictive for that German chocolate cake fan in your life. Plus, not having to heat up the house makes them perfect for summer. 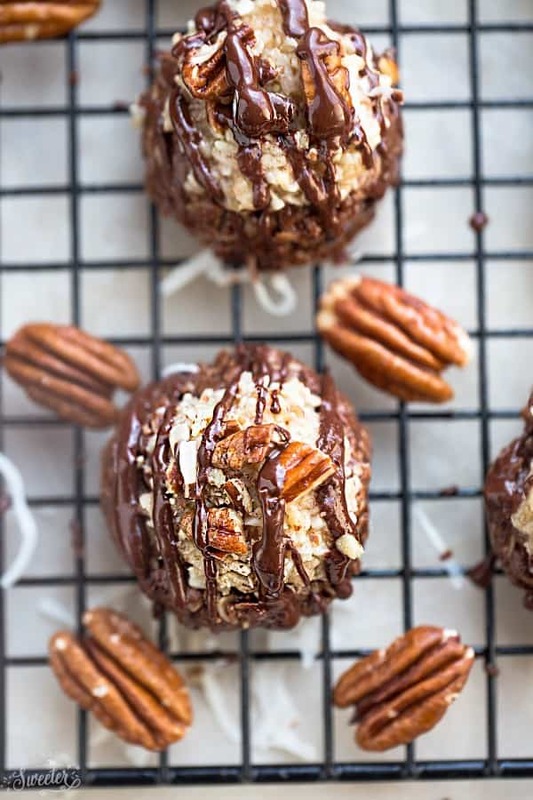 Soft and chewy No Bake German Chocolate Cake Cookies made with a rich chocolatey oven free oatmeal base topped with a gooey coconut pecan frosting and a drizzle of chocolate! They're egg free, dairy free and paleo friendly. Combine maple syrup, coconut oil, chocolate chips and cocoa powder in a small pot over medium-high heat. Bring to a boil and continue cooking for 2 minutes; then remove from heat. Stir in almond butter, salt and vanilla extract. Fold in coconut then add oats and stir until combined. Using a small cookie scoop, compress mixture very firmly into scoop, drop cookies onto prepared baking sheet and press down to flatten and make a slight indentation in the cookies. Place in the fridge for 15-20 minutes, or until cookies are set. To make the frosting: In a small saucepan over medium heat, add coconut milk and maple syrup and allow to simmer for 10 minutes, until thickened. In a small bowl, combine arrowroot (or corn starch) and water to form a smooth paste and pour into saucepan. Bring to a boil, while whisking constantly. Remove from heat and slowly stir in coconut oil and vanilla. Add the shredded coconut and pecans and stir until combined. Chill in fridge for 30 minutes or freezer for 10 minutes. Spread a spoonful of frosting over the tops of cooled cookies. 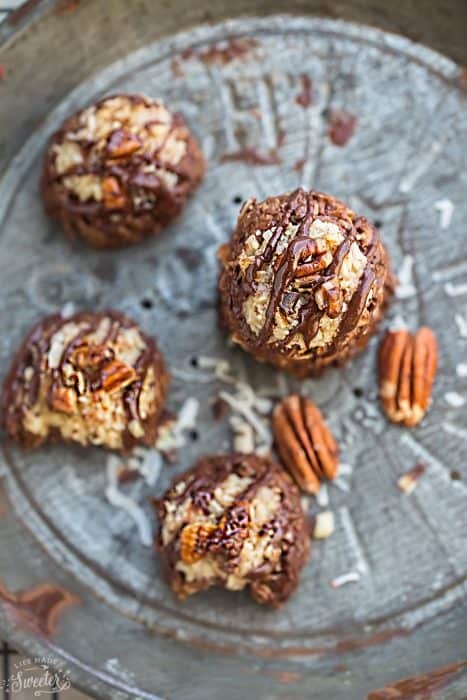 Sprinkle with more pecans if desired and drizzle with melted chocolate using either a spoon or a zip-top bag. Enjoy immediately or chill in fridge for 1 hour for a thicker frosting. Store remaining cookies in an air-tight container in refrigerator.